Every historian hopes to visit the places they have studied and researched and envisioned. 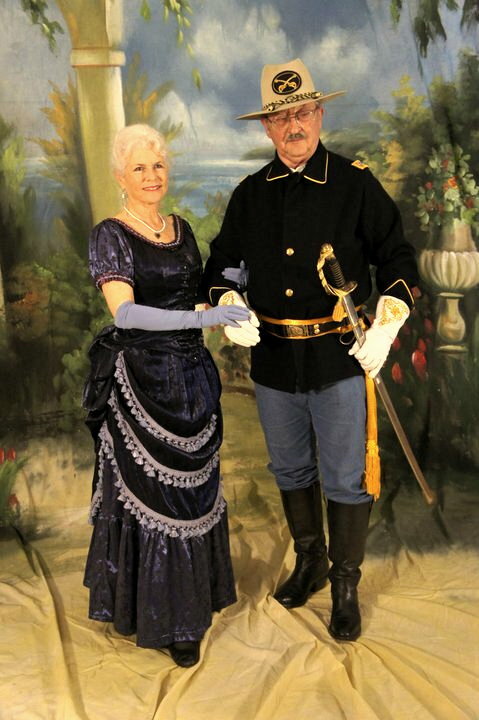 And so it was with Col Richard Dodge and his bride, Blackjack Annie. Plans began to form many months ago to do just that  visit some of the sites about which I've written for the Single Action Shooting Society Chronicle. It started with the idea of visiting the sites of the murder of Colonel Albert Jennings Fountain near Las Cruces, New Mexico, about which the article "Murder in the Tularosa" was written. As long as we've gone that far, we reasoned, why not go to Trinity Site for its open house on the first Saturday in April. Lincoln, New Mexico was just down the road. Why not go on to San Antonio to visit the Alamo and the Texas Ranger Museum in Waco! And guess what's on the way: Langtry, Texas and Judge Roy Bean's Jersey Lily. Big Bend National Park. The Elizabet Ney Museum in Austin. Carlsbad Caverns just happened to be in the area. From the homestead in Orange County, CA (near Single Action Shooting Society's birthplace), our first stop was Payson, Arizona and a visit to the site of the Battle of Big Dry Wash, the last battle of the Apache Indian Wars for which four Congressional Medals of Honor were awarded. It required a long, difficult drive over the old "Cooks Road" and a rugged hike to the site where a marker listed the names of those who participated in that final skirmish, commanded by then-Captain Adna Chaffee, later to become General of the Army. It was a very long drive to Socorro, New Mexico and Trinity Site, with a hilarious stop at Pie Town on the way. Trinity Site is sobering. One cannot imagine the enormity of the event that happened there, our abrupt introduction to the Atomic Age. One wonders at the very shallow depression surrounding the rock pylon that marks the site of the 100-foot tower vaporized in that first nuclear explosion. Just down the road, across the Valley of Fires, is the little town of Lincoln, New Mexico. Valley of Fires is an ancient lava flow that would have required a three-day ride to bypass before a road was driven through it as early as 1910. It's an amazing site to see, ancient lava flows warped into fantastic shapes, alive with plant and animal life. The lava lies over 160 feet deep at the narrow section of the valley. That little road leads on to Lincoln. We all know about Lincoln, the Lincoln County War and Billy the Kid. Lincoln is almost perfectly preserved; the courthouse where Billy made his famous escape by killing his two guards still stands, as do many other buildings of the time. We had an elegant lunch at the historic Wortley Hotel, originally owned by none other than Pat Garrett. 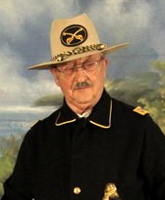 Park rangers tell interesting and unknown stories about "The Kid" and events surrounding the war, all material for upcoming articles. Stay tuned. From Lincoln, we followed the same trail that Colonel Fountain followed on his fateful ride from that very courthouse to his home in Mesilla, just outside Las Cruces, New Mexico. Alongside the I-70 freeway near the White Sands National Monument, a lonely marker identifies the site where Fountain and his eight-year old son, Henry, met their deaths at the hands of unknown killers, their bodies never to be found. It's a very lonely place to die, the pass to home plainly visible in the Organ Mountains less than five miles away. Mesilla, New Mexico is another well-preserved Old West town, now a bit of a tourist attraction, as it should be, with its share of souvenir shops and restaurants (very good ones, I might add). We met up with Dr. John Smith, a retired agriculturalist and one of the most knowledgeable Old West historians I've ever met. He took us in hand and led us on an exhausting tour of the area, including a daunting trek through desert mesquite to Pat Garret's murder site and to his grave in the old Masonic Cemetery. Then we met the great, great granddaughter of Colonel Fountain, Ms. Mary Bird, curator of her family's historical home and museum, the Gadsden Museum. A charming and gracious lady, Ms. Bird proudly led us through her priceless collection of family memorabilia, including many of the colonel's artifacts, uniforms, and firearms. One can only hope that her museum endures for future generations to enjoy. Down another long, long road, (warning: Texas does not have rest stops on those long, long roads) we came to the pretty town of Alpine, Texas, almost an oasis in the midst of the vast West Texas desert with a startlingly elegant college campus on the edge of town. Ninety miles further to the south, Big Bend National Park occupies the impressive, rugged land inside the "big bend" of the Rio Grande. A full day of exploration took us into the park's impressive mountainous interior and a drive to the river. Here, the Mexican side of the border is an awesome, vertical 1,200-foot tall cliff face. We followed the river upstream to the beginning of the Santa Elena Canyon, where the cliffs on both sides of the river stand the same 1,200 feet, straight up and down. A beautiful hike back into the canyon along the cliff face reveals a beautiful hidden world  a wonderful place of study for scientists of every discipline. Interestingly, the Rio Grande is almost dry, now only elongated pools of green water. vNext came one of the real icons of the Old West: Langtry, Texas and Judge Roy Bean's Jersey Lily. One had to really want to go there, I thought several times on the long road to Langtry. The tan walls of a modern building meet you there, with a sign reading "Judge Roy Bean Museum" across the front. Inside the modern lobby, a young lady refused our offer to pay admission  it was free, we were told. Just go through the door to the interior. And there it was! Standing dark and stubborn, defying time, stood the original Jersey Lily. Inside, you could belly up to the same bar, put your foot on the rail and imagine ordering up a drink of the judge's watered-down whiskey. There was the pot-bellied stove with a table and chair standing nearby. The billiard room, which occupied the other half of the building, was empty but for the historic old photos on the walls. It seems that this is actually the second Jersey Lily, the first having been burned down during one of the Judge's absences  he did have his enemies, after all. Fredericksburg, Texas is one of the most famous of Texas towns, just off I-10, home of Texas Jack's (where we dropped a bundle), the Admiral Chester Nimitz Museum (the admiral came from Fredericksburg), and a wonderful old historic downtown. We know that our own Judge Roy Bean resided in Fredericksburg; not sure if he still does. vSan Antonio is only 90 minutes away and we struggled with big city traffic we hadn't experienced since leaving home. Gotta tell you, there's some good places to eat along the famous Riverwalk. Started in the 1920s, the Riverwalk follows a "D-shaped" bend in the San Antonio River, the straight shaft of the "D" being a man-made flood control channel. It seems that everyone in San Antonio is out walking there. Great people watching. They say if you fall into the river, just stand up. It's only three feet deep. The Alamo, of course, is the main point of interest. We learned that even John Wayne didn't get it right (sorry, folks). The famous façade of the old church doesn't even look the same as it did then and most of the battle was fought well out in front of the church in the massive 4 1/2-acre courtyard. It's very size made it indefensible by the 189 defenders; they say a thousand men couldn't have defended it. The exterior walls were demolished after the battle by the Mexicans to prevent its further use as a fort and subsequent development almost destroyed any evidence of the mission's footprint. Fortunately, the Daughters of the Republic of Texas saved the site from complete destruction. Now it is Texas' most hallowed spot. There's a story coming on the battle of the Alamo, told as related to us by the Alamo's historians. Another 90-minute drive up I-35 brought us to Austin, Texas and a visit to the stately Capitol building that just had to be taller than the nation's own capitol building. We were told that at least one legislator tried to introduce a bill that no one could erect a building that could obstruct a view of the capitol building. It was somewhat reassuring to see legislators walking through the building wearing huge Stetson hats. And there, as we expected, were the two Elizabet Ney statues of Steven Austin and Sam Houston, guarding the entrance to the building. Unfortunately, her Formosa museum was closed for repairs, a major disappointment. The Texas Ranger Hall of Fame and Museum in Waco, Texas was a major objective of the trip. It holds an amazing collection of firearms that figured in Texas Ranger history, including personal handguns of many famous Rangers. They sure did like fancy guns, engraved, inlaid with gold and silver, stocked with exotic wood, ivory, and precious metals. I recall seeing only one "stock: Colt 1911 in the entire collection. There was the arsenal found in Clyde Barrow's car following the "Bonnie and Clyde" ambush, as well as the firearms used by the officers who took them down. Needless to say, the tour of the museum took several hours, including watching the very well done film on Texas Ranger history. I was pleased that it didn't try to whitewash the Ranger's checkered history, but I wish they had included the story about Colonel Fountain's role in re-establishing the Rangers when he was active in the Texas legislature; they had been disbanded by an earlier Texas governor. One last stop in Waco: the Dr. Pepper Museum. We learned that Dr. Pepper was created in Waco. Having a Dr. Pepper float in the restored old drug store was a blast from the past. It's a nine-hour drive to Carlsbad Caverns through Pecos, Texas. A quick stop at the "West of the Pecos Museum" was well worth the time. Artifacts from the early days of the Texas cattle days would warm the heart of any cowboy fan. It turns out that Carlsbad Caverns was discovered and developed by a cowboy named Jim White. His little booklet tells of his early explorations of the caves and how none of his fellow waddies would believe his stories of the wonders he'd found. The Caverns are indeed wondrous to behold, fantastic shapes and forms of limestone created by dripping water over millennia. One shudders to see the damage caused by thoughtless and stupid visitors; many local volunteers spend countless hours cleaning up after them. The accommodations for walking through the caverns are carefully constructed and safe for anyone. Another long drive brought us to Tombstone, Arizona, last stop on our odyssey. What can you say about Tombstone? We'd been there before and noted some sad changes. No more gunfights in the streets. William Brown Leather Maker is no longer there. Neither is Spangenburger's Gun Shop. The only other "western" gun shop is almost closed. Dang yuppies musta moved into town. Tombstone's lost a lot of its "Old West" spirit and attraction. At least I was able to find a nice pair of long-sought-after "double eagle" boots that fit. They were even on sale! One thing this trip confirmed is the enormity of the American West. Even the thin slice we covered took three weeks and barely scratched the surface. It clarified many issues not fully understood, uncovered new characters and events to explore, and reminds us again of the wonderful history of our great nation. Blackjack Annie and I are already thinking about where we'll explore next.